Back in era of elixirs, one in Auburn claimed to expel lizards from your stomach. Frogs, too. This is the home at 15 Drummond St. in Auburn where Dr. John Fogg True lived with his family and manufactured J.F. True's Elixir after moving to Auburn from Dexter in 1854. AUBURN — If you believe the advertising in the latter half of the 19th century, gulping down a bit of Dr. J.F. True’s Elixir offered the best possible treatment for everything from a headache to a lizard living in your stomach. Regardless of whether it really worked or not, the dark and somewhat alcoholic liquid that was shipped out to druggists across the country under True’s name put Auburn on the map. An 1880 advertisement for Dr. True’s Elixir in a Lewiston-Auburn business directory. Nearly forgotten today, the Auburn-made mixture was once a staple for many families angling to “Keep Children Well” in an era when the medical profession had yet to find its bearings and sickness was striking down a hefty share of American youngsters. At a time when truth-in-advertising regulations essentially did not exist, True made staggering claims for his brew. A photo card of Dr. J.F. True of Auburn, probably taken about 1880. For many families, True’s Elixir became a cure-all. 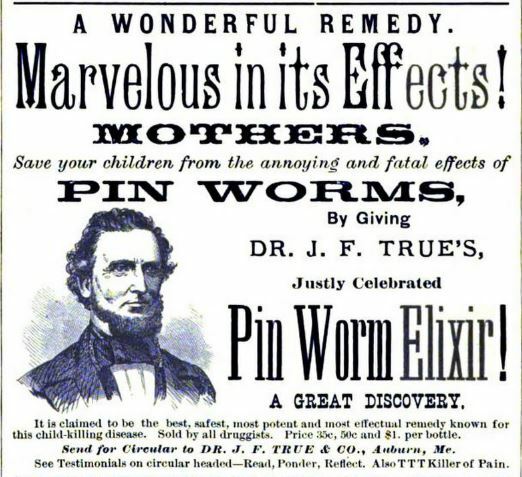 When “an anxious mother” wrote to the Talk With the Doctor column in American Motherhood magazine in 1910 about her sickly 4-year-old daughter, she wondered if the girl’s inability to sleep, crying and “very bad odor” might be the result of worms. “I have given her Dr. True’s Elixir thinking this might help her,” the woman said. The doctor doubted the diagnosis. In a 1913 case history of pediatric patients, John Lovett Morse mentioned 3-year-old Russell, who was growing weak, acting irritable and picking his nose a lot. “His mother, suspecting worms, had given him True’s Elixir several times, but never obtained any worms,” Morse wrote. He said he wouldn’t even take note of the possibility of worms except that the diagnosis was so commonly made by mothers, grandmothers and even doctors who ought to know better. 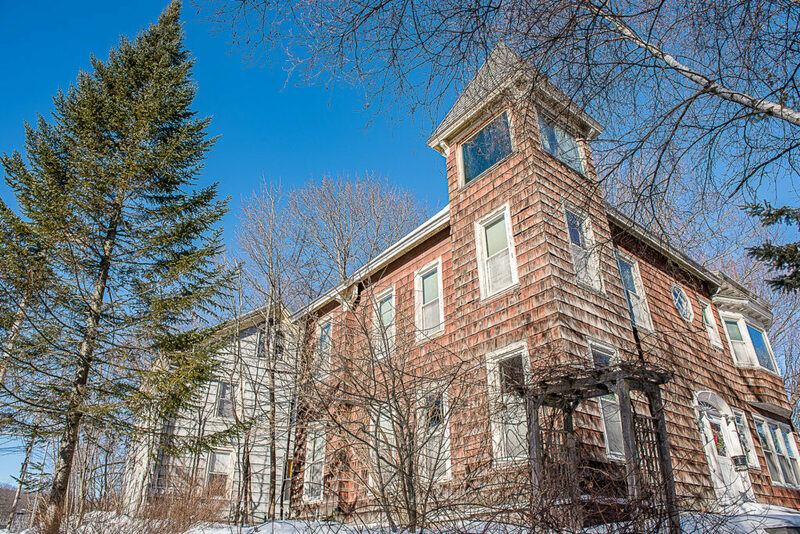 Joy Swan’s account of a girl’s life in rural Maine more than a century ago, “Aunt Susy’s Boarding House: The Story of A Girl Growing Up In Maine,” showed the importance some placed on True’s medicine. After the passage of the Pure Food and Drug Act in 1906, which forced patent medicine hawkers to tone down their ads, True’s company dropped its most outlandish claims and relied on vague assurances of better health and the long-established habits of customers to continue churning out its famed elixir. By 1923, True’s company was selling more than 150,000 bottles of the stuff annually. It also offered a wide array of other products, from headache pills to True’s Sore Throat Gargle. Unlike most of the medicines of its time, the active ingredients of True’s Elixir are not lost to time. 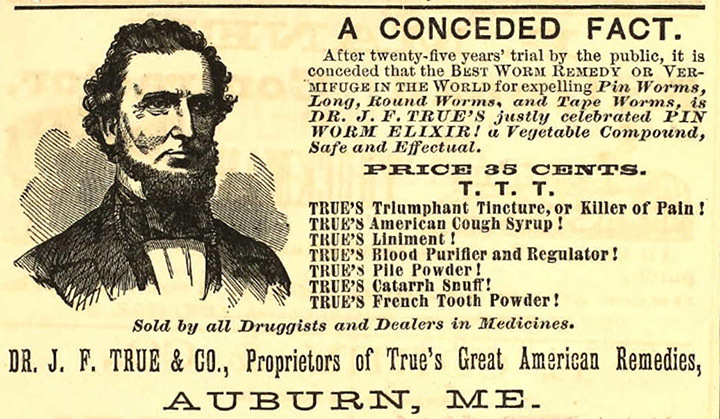 An 1874 advertisement for Dr. True’s Elixir in a business director for the Lewiston-Auburn area. John Phillips Street, a Connecticut state chemist, figured out in 1914 that it contained 8.5 percent alcohol by volume as well as Santonin and Emodin. Santonin was a widely used drug that paralyzed the heads of parasitic worms, causing them to release their grip on internal organs so they could be passed out of the body. It has been replaced by safer drugs today, but at the time, it was the appropriate treatment for someone with worms. Emodin is a traditional Chinese herbal laxative made from rhubarb, buckthorn or Japanese knotweed, that invasive species that irks so many Maine gardeners. Emodin is used almost entirely in labs today, replaced by safer alternatives in commercial products. What else might have been included is unknown. What is known, though, is that it smelled. Back in 1972, Colby College historian Ernest C. Marriner mentioned on his radio series “Little Talks on Common Things” that old-timers recalled “the pungent odor of herbs and other concoctions that pervaded the atmosphere” around True’s Auburn laboratory. For a widely known figure in his day, there’s surprisingly little available to shed light on the man behind the medicine. From census records, it appears all but certain that the J.F. 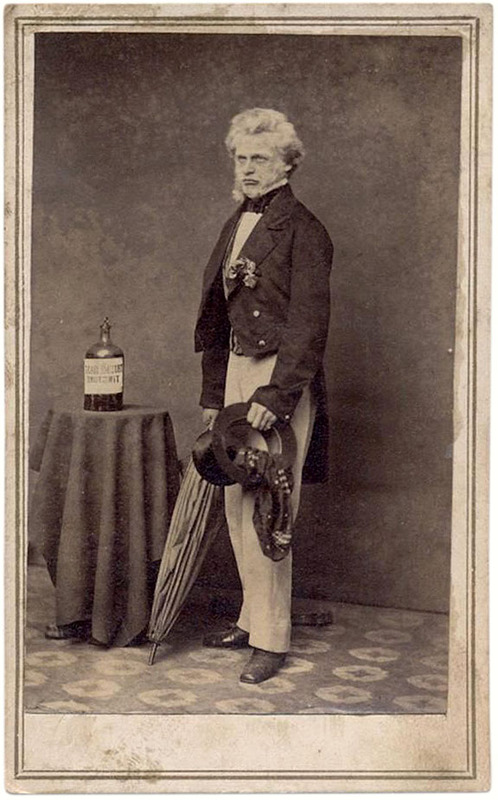 True on all those bottles and advertising was John Fogg True, a physician. Living in Dexter in 1851, True created his famous elixir in his own kitchen “though he did not realize at the time that he compounded a remarkable medicine,” as a 1921 story in the Lewiston Daily Sun put it. At first, he merely used it himself, then he introduced it to neighbors and, finally, to customers. One of his first decisions after creating the new medicine was to move away from tiny Dexter to a place just beginning to come into its own, Auburn, which offered ready access to the Androscoggin and Kennebec Railroad. That made shipments to Portland, Boston and beyond far simpler for him. By 1854, he had moved to Auburn with his wife, who won prizes that year from the Androscoggin County Agricultural Society for her picture frames and woolen hose. An 1860 business guide listed him as a patent medicine manufacturer on Court Street. That same year, he took out an ad in the Lewiston Gazette touting his product to local consumers. 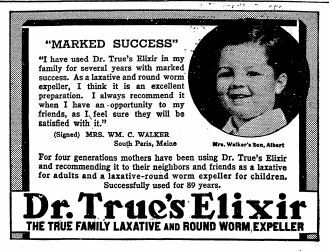 As time passed, more and more New England families opted to keep children safe with regular helpings of True’s Elixir. By 1877, True had built a laboratory “to keep pace with the ever-increasing demand for his medicines,” according to the 1921 Lewiston Sun story. He expanded it eight years later. A 1940 advertisement for Dr. True’s Elixir. “The product had by this time won a sure name for itself and its worth was recognized in the medical world. 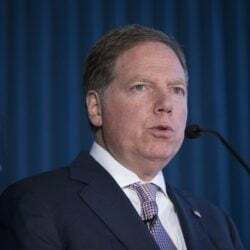 It was fast becoming a by-word in the household and proportionately the firm continued growing,” the paper said in a brief history of the company. True then erected a spacious laboratory in 1891 in the rear of his family home on Drummond Street. He lived in the two-story 1848 colonial that still stands, though his laboratory is long gone. Those studies, it said, led to the discovery of the elixir. He died three years later. Advertising was likely the key to True’s success at a time when snake oil salesmen were hawking patent medicines in any venue where a customer might be found. It had a long list of newspapers where its ads regularly appeared, placed by the Boston office of one of the country’s biggest marketing firms. “All in all, the advertising is so much better than the general run that it is no wonder that the business has grown since 1851 when the product was made in a kitchen to the present pretentious manufactory having six compounding vats, each with a capacity of hundreds of gallons,” the magazine added. True’s death in 1900 appears to have done little to slow the company’s growth. After the doctor’s demise, his sons, Edward and James, continued the enterprise for a number of years. 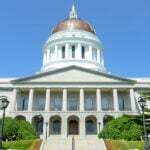 In 1907, the Maine Chamber of Commerce said they were doubling the firm’s business each year. Despite federal regulations, the Auburn company didn’t easily abandon its patent medicine roots. After the death of True’s sons, the family sold the company in 1947 to Auburn financier George Lane, “who made the business a subsidiary of a larger corporation with a laboratory in Hanover, Mass.,” according to historian Marriner. Before long, it was owned by George Tobias of Natick, Mass., who manufactured True’s Elixir in the 1950s. Something else on the label jumps out: Its ingredients had changed. By 1952, it still contained 8 percent alcohol but its active ingredients were senna leaves and aloin, neither of them present when Connecticut’s chemist analyzed the elixir before World War I.
Senna remains an over-the-counter laxative commonly relied on to treat constipation and also to clear the bowels before such diagnostic tests as colonoscopies. Aloin is a bitter, yellow-brown compound made from aloe leaves that was also used to treat constipation until the Food and Drug Administration pulled it off the market in 2002 due to safety concerns. The manufacturer kept churning it out along with some other old patent medicines with renowned names, including Lydia Pinkham’s Vegetable Compound. In any case, the last bottle that carried the Dr. True’s Elixir name landed on a drug store shelf in 1955. It hasn’t been manufactured since.